Children today are bewildered and sometimes frightened by the nightmarish atmosphere of Alice’s dreams. 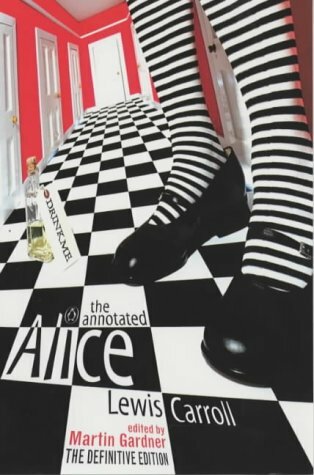 It is only because adults — scientists and mathematicians in particular — continue to relish the Alice books that they are assured of immortality. The first one is a riddle; arguably the most devious riddle ever conceived. Gardner gives several possible solutions, including the one published by Carroll himself. In my opinion, the best and cleverest is Carroll’s. For the first time reader, the annotations, which have a tendency to grow into mini-essays, tend to distract from the flow of Carroll’s engaging narrative. To get an unadulterated feel for the books on the first reading, I skipped most of the annotations and would in fact venture to suggest that all first time readers do so. Read separately, the scrupulously researched annotations are lively, entertaining (endlessly diverting? yes!) and a great source of indispensable information. This entry was posted in Books, Notes on Literature and tagged Alice, Alice in Wonderland, Annotated Alice, Gardner, Lewis Carroll, Mad Hatter, Martin Gardner, Raven, Through the Looking-Glass, Why is a raven like a writing-desk?, writing-desk. Bookmark the permalink. Hi da. This is the first time I’m reading your posts. I must say you’ve got a great skill of writing. I may not be a judge or a critic to acclaim your writing. But as you’d say I’m just a reader. My construal (well, it may be subjective!) of your writing and its sense exhilarates me to read more even if the topics you choose are not in line to my knowledge and definitely above comprehensibility of my woefully unqualified intellect. This is not just about this blog. I ran through other blogs of yours as well. I’m not a blogger or a computer savvy. But I’ll make it a point to read through your blogs. Your writing is awe to me. Keep it up – your writing and your reading habit. Hi Vinod! Thanks for your comment. This is the first time that a real, not just virtual, friend or aquaintance of mine has commented on any of my blogs. I should say you’ve been very generous in praising my writing. The fact that someone is following my blog will definitely go a long way in ensuring that I continue to delve deep and keep reading and writing on a variety of different subjects. So keep reading!